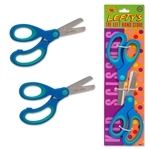 144 packages, each with two pairs of colorful Lefty's custom left-handed blunt blue scissors for kids, 5 years old and up. • 5-1/2" long with 2" blades. • Generous finger holes make scissors easy for little lefties to manage. • Easy to clean and durable stainless steel blades. 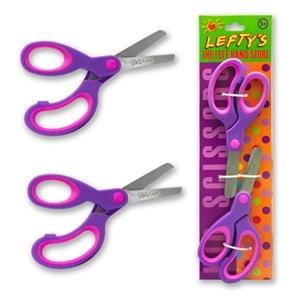 Our scissors are true left-handed scissors. The grip is custom designed for lefties, and the blades are reversed, so that lefties can see what they are cutting.